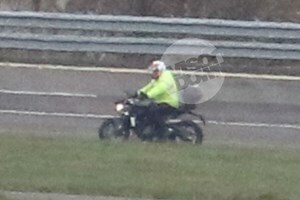 THEY may be murky, but trust us: these pictures are the first glimpse so far of the next-generation Triumph Street Triple. While it’s hard to make out details in these pictures, there’s just enough evidence to show that they’re not simply shots of the existing Street Triple and nor are they images of the Speed Triple. Instead they show a machine that seems to have elements of both, which makes a compelling argument that they’re the new 800cc Street Triple that’s currently under development. We already know that the replacement for the Street Triple is set to get a capacity hike. A buyers’ survey was sent out last year asking potential owners about their preferences for the machine and listing some detailed – if provisional – specifications for the projected future Street Triple range. Most importantly the bike was listed as having a capacity ‘above 750cc’ and available in four distinct models. As well as a 110bhp base model with non-adjustable Kayaba suspension and a 115bhp ‘R’ version with adjustable Showa kit and radial Nissins, the survey listed an ‘RT’ model with 125bhp and a load of touring add-ons including a screen. At the top of the range was an ‘RS’ – also with 125bhp but gaining Ohlins suspension and Brembo brakes. It all fits with Triumph’s recent trend of adding extra model variations within its existing ranges. The extra capacity is likely to be a reaction in part to the significant engine updates needed to pass Euro4 emissions rules. These changes alone might well have reduced the power of the 675cc motor, but boosting its capacity more than recoups any losses. Unlike the long-stroke Tiger 800 engine, the Street Triple is likely to gain its extra cc’s via a bigger bore. If you peer at these pictures, you can just about see that the swingarm is much more heavily braced than the current Street Triple’s – something that our photographer confirmed. However, it’s clearly double-sided, so can’t be from the Speed Triple. The lack of under-seat pipes also shows this prototype isn’t a Speed Triple. A pair of metal cowls appear to cap either end of the radiator, which mimics a styling tweak on the new-for-2016 Speed Triple and again makes sense as an update for the Street Triple’s styling. Meanwhile the rear ¾ picture shows that the bike has gained mirrors mounted to the ends of the bars, which is another key element from the 2016 Speed Triple. The widely-published page from last year’s Street Triple survey lists other changes including the addition of three riding modes (five for the ‘RS’ model, including a track mode), and a new TFT display. It also suggests that the RT will be optionally available in half-faired, sports tourer form. 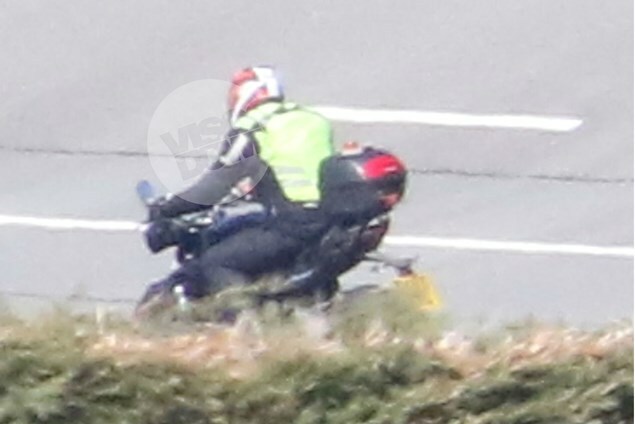 Given the usual routine for Triumph spy pictures, you can be pretty sure that we’ll get a closer look at the new Street Triple from other spy shots over the next few months before it’s officially unveiled, probably at one of the shows towards the end of this year.